In ancient times, a powerful demon existed at the continent of Magvel. Five heroes sealed away the demon using the Sacred Stones and built their own countries protected by the Stones. However, in the year 803, the long-lasting peace is broken when the powerful Grado Empire suddenly invades the Kingdom of Renais. Renais, a nation that has been long-time friends of Grado, is taken by surprise and is seconds away from being conquered. Princess of Eirika, of Renais, leaves her homeland to warn their ally, the Kingdom of Frelia, and to seek her twin brother, Ephraim, whom she has lost contact with. is the third Fire Emblem title for the GBA, and the second to be released in English. It featured many subtle improvements over its predecessor, Blazing Sword, and is possibly one of the most complete Fire Emblem games yet. However, more isn’t always better and the game suffers from a few flaws, such as low difficulty and a short storyline, which has led some fans to consider it one of the weaker games in the series. Still, the game is of very high quality and is well worth checking out for its interesting features alone. Instead of continuing the story and setting of the previous two games, the game begins an unrelated storyline set in the new continent of Magvel. This time, the main heroes are royal twins Eirika and Ephraim, and the game follows their journey to reclaim their homeland and prevent the destruction of the titular Sacred Stones. Early on, players can choose which of the twins to follow and the storyline subsequently branches for several chapters, before joining up towards the final part of the game. From there, the twins focus on the increasingly difficult trials ahead. Buying weapons from the Armoury. The story isn’t the only thing that’s new though, as there are plenty of new gameplay features, most of which are borrowed from Fire Emblem: Gaiden, which this game is clearly inspired by. The most prominent additions are the ability to move around the game’s World Map and branched promotions, both of which add more variety and replayability. For Fire Emblem novices (or those who need a refresher), as well as a few tutorial chapters, there is an in-game Guide, which can be accessed at any time if you ever need help understanding gameplay features. When promoting characters, players can now choose one of two higher classes for them to upgrade into. Which class you pick only has a minimal effect on character stats, as character growth is unchanged. However picking a particular class over another may award more movement, a different new weapon type or an extra Skill. 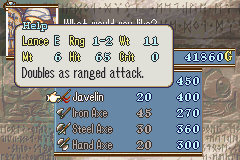 Last seen in Thracia 776, Skills make a return, although in a somewhat watered down form. Some promoted classes have their own unique Skill, which can give them an advantage during battle. For example, the Pierce Skill possessed by Wyvern Knights has a chance of negating the enemy’s Defence for one strike. Three characters in this game belong to a Trainee class (Journeyman, Recruit and Pupil), which exist below the regular lower classes such as Fighter or Cavalier. As such, these characters are considerably weaker than most, however they also have the most potential, as they can gain more Levels than other characters. When these characters reach Level 10, they automatically promote at the start of the next chapter and players can choose to upgrade them into one of two lower classes. 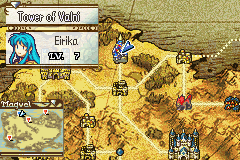 Eirika traverses the world map. A feature last seen in Fire Emblem: Gaiden. Unlike most other games in the series, the World Map in this game isn’t just for show. Here, players can choose to enter story battles to advance the storyline or EX Maps (optional battles) to train their characters. They can also visit shops to purchase weapons and items for their characters. Another feature that was previously unique to Fire Emblem: Gaiden. Besides the usual human enemies, there are also enemies that are monsters. These enemies appear in EX Maps and often appear in the main story as well. Besides their appearances, they don’t differ much from human enemies though. After completing a Fire Emblem game, there isn’t usually much more to do besides starting a new game. However, in this game, you can continue your progress from a completed Epilogue file, in the Creature Campaign mode. This mode never ends and places you back on the World Map, where you can do pretty much everything you could do in the main story (except there is no longer any story). So you revisit all the EX Maps, continue building up Supports and etc.